Discussion in 'Houston Rockets: Game Action & Roster Moves' started by cdrive, Sep 24, 2015. I'll edit this & populate it as the ranks come in. I think this is going to (A) show us how stacked we are this season compared to how we started the last regular season & (B) show us how stacked we are compared to what we had last year in the playoffs. It's also interesting to see "where are they now?" For example, Jeremy Lamb...wow...the most lopsided trade in the history of sports just keeps getting more and more lopsided year by year. I made a thread for this in the Dish, but good idea to make a GARM thread specifically about Rockets players. They'll probably put Harden at about....oh, say, #4, after Curry, LeBron, and Anthony Davis. As the list gets updated (thanks, cdrive), you can bet that "former Rockets" list will be thiiiiiiiiiiiiiiiiiiiiiiiiiiiiiiis loooooooooooooooooooong. Slap in the face to Carl Landry ... unless he is out injured or something that I don't know about. He's not great, but he was serviceable last year. Yeesh @ Landry ranking below Troy Daniels. Life comes at you fast. Kostas Papanikalou - 29 minutes as a starting forward, 1st time getting feet wet in the NBA. Replacement this year: TJ or D-Mo. Tarik Black - 15 minutes as starting Center. 1st time getting feet wet in the NBA. Isaiah Canaan - 39 minutes as starting PG. Carl Mandry will always hold a special place in my heart. Even NBARank can't figure out what is even the point of Pablo Prigioni. Lol, I still remember this play. 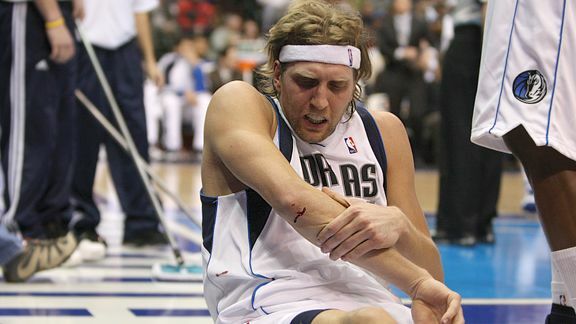 And I remember that Dirk kind of rolled around on the floor, grimacing in pain, and holding his elbow. Carl Landry... well he just calmly reached up to his mouth with his fingers, pulled them down and saw blood on them, and then motioned to the Rockets bench for a sub as he started walking to the locker room. I still remember when we had Carluis Scolandry. Both of those guys were good, but man, I used to love Landry. Capela, barring injury or stupid coaching, is set to jump IMMENSELY in that list this year. how can you rank the "current squad"? they've played a total of 0 games together. title of thread should read: "Where some rockets players stand in a bull**** ranking system"
So basically you believe Thorton has equal odds with Harden as being the best player for the Rockets since there have been zero games played? Chris Paul Full Highlights 2019 WCR1 Game 3 Rockets vs Jazz - 18 Pts, 4 Asts, 4 Rebs, 3 Stls! James Harden Full Highlights 2019 WCR1 Game 3 Rockets vs Jazz - 22 Pts, 10 Asts, 6 Steals!